A graduate of Exeter University in the UK in the early 1980s, I spent twenty years as a teacher of French, Latin and Classical studies, before a change of career led me to writing children's fiction for Middle Grade readers. Currently residing in Abu Dhabi in the UAE, I live with my husband and our beautiful Tonkinese cat. Shadows from the Past is a series of time-travel adventures, featuring three children and a rather unique feline companion. In addition to the full-length books, there are also some short stories – Max's Adventures - all of which are spin-offs from the series, featuring Max the cat on special solo missions. Shadows from the Past is far from complete. Still only halfway through the series, my young time-travellers have many more adventures to come. As I take my readers on a magical mystery tour through the past, I’m hoping that my love of history, myth and legend will rub off on them too. 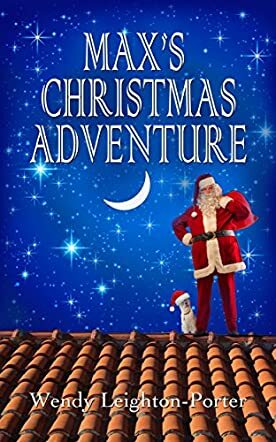 Join Max, a large Tonkinese cat, as he goes on a special mission with the most unlikely of people in Max's Christmas Adventure by Wendy Leighton-Porter. Max is a different kind of cat. With the aid of a magical amulet, he can speak and understand any language, even human language. It's a good thing too, since he and his owners, young Jemima and her twin brother Joe, travel through time. Only this time, Max will be traveling without the twins. When Max encounters a strange being on the roof of the twins' uncle's London house, in the middle of the night, he is both curious and frightened. Who is the strange figure and how did he get there? What does he want? Max finds out that the man wants Max to join him in a quest that could help make the twins' dreams come true; their parents returning home! Out of love for the twins, Max reluctantly agrees to join the stranger to help look for the twins' disappeared parents. But what will they find? Can they find Mum and Dad before Christmas? Or will Max be lost in time, possibly forever, too? Max's Christmas Adventure is a short installment of the Max's Adventures stories and an offshoot of the Shadows From The Past series, to be read before The Shadow of the Two Princes. Although it is placed in the middle of the series, I had no trouble following the story, and it made me want to read more Max's Adventures and the whole Shadows From The Past Series! Max's Christmas Adventure is a great book to read when preparing for Christmas. Even though the series is written to coincide with the twins' school break in the summer, the author manages to make the book a true Christmas tale that had me ready to break out the Christmas music and decorations, and look for more books from Wendy Leighton-Porter. If you are a Shadows From The Past series fan, then be sure you don't miss this book. If you are new to the series, catch up by reading Max's Christmas Adventure, and get into the spirit of Christmas. It being a short chapter book, I would assume it is written for children ages 8-12, but I believe that the whole family will love it. I found the book to be interesting and charming, a completely enjoyable read and look forward to reading more Shadows From The Past books by Wendy Leighton-Porter.